FATHER BENEDICT SUING, O.S.B., a monk of Mount Angel Abbey in Oregon, U.S.A., passed peacefully to the Lord on the 7th day of December 2018, in the 93rd year of his life, the 70th year of his monastic profession, and the 65th year since his ordination to the priesthood. The funeral Mass for Fr. Benedict will be at 10 am Friday, December 14, in the Mount Angel Abbey church, with burial to follow in the Abbey cemetery. Fr. Benedict was born in Salem, Oregon, in 1926, and in his early 20s he entered Mount Angel Abbey, making his profession of vows in September of 1949. After his theological studies at Mount Angel Seminary, he was ordained to the priesthood at the Abbey in 1954 by Archbishop Edward D. Howard of Portland. The following decade involved Fr. 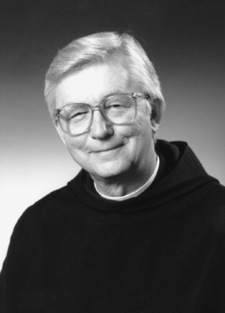 Benedict in the work of teaching English in the Abbey’s prep school, and in the mid-1960s he also taught for two years at a high school in Anchorage. Significantly, Fr. Benedict spent many of his years as priest and monk outside the monastery, carrying out the various pastoral assignments in which he generously served the Church. The first of these assignments came in 1968 when he was appointed assistant pastor at St. Mary’s in Mt. Angel, after which he served as principal of a Catholic high school in the coastal town of Tillamook, Oregon, for several years before returning to the town of Mt. Angel as pastor of St. Mary’s from 1975 to 1985. There followed a several-year pastorship in Moab, Utah, and then a final decade in parish ministry as pastor of Sacred Heart Parish in Portland, from 1990 to 1998. But Fr. Benedict’s pastoral spirit remained alive, and he served for some further years as chaplain of a small religious community in the east before retiring into the prayerful quiet of his final years. May he rest forever in the peace of Christ. Thank you for your prayers for him.